They really weren’t. The bottle of water I drew looks more like a wine bottle. The two people, who were actually chatting look more like they are waiting for something to happen. The title works for the reality I created, not for the world of those two, at that moment. I can do this, since I just renewed my artistic license. 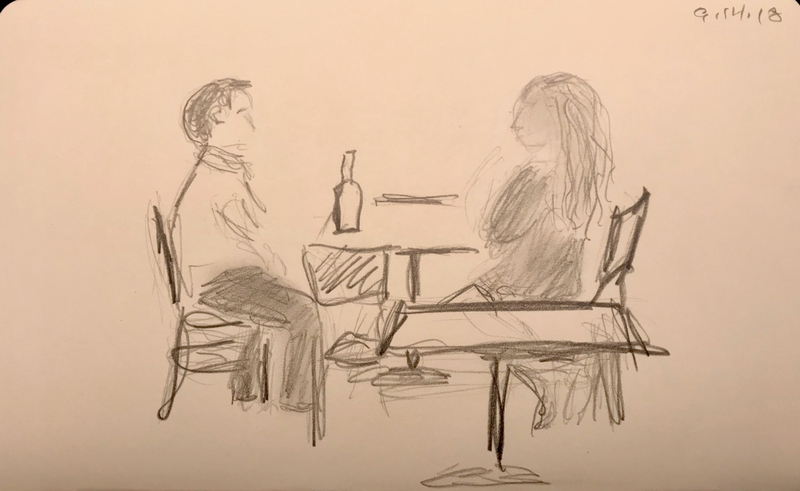 This entry was posted in Personal Stories and tagged art, artistic license, creative process, drawing, party toast, pencil sketch, sketch, visual art, watercolor, wine toast. Bookmark the permalink. I like this whole post, image and commentary. Artistic license! Thanks, Claudia. I just realized that I don’t have to document everything. I can make up whatever I want. I think in this one comment you have expressed having reached the art nirvana. When reality is yours!